June 15, 2017 (Menomonie, Wisconsin) – Lindstrom Equipment, Inc. has announced it will join the Apache dealer network with its two dealership locations in Mondovi and Menomonie, Wisconsin, beginning June 2017. 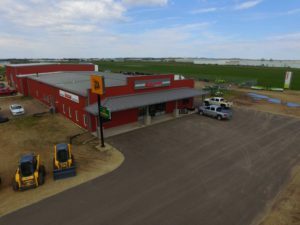 These new Apache Sprayers dealerships will provide sales and service to most of Western Wisconsin and some counties in Eastern Minnesota. Lindstrom Equipment began with founder John Lindstrom in 1958. Nearly 60 years later, the company continues to thrive in the hands of second and third generation leadership. Their willingness to go the extra mile has earned customer loyalty and unending, word-of-mouth business. For more information about Lindstrom Equipment, please visit www.LindstromEquipmentInc.com. Apache Sprayers creates simple, dependable, lightweight and affordable self-propelled sprayers for the everyday farmer. Every sprayer is manufactured in Mooresville, Indiana, by the Apache Sprayers parent company Equipment Technologies. The Apache brand was honored with the EquipmentWatchTM Highest Retained Value Award in 2016 and 2017 for the 1000 series Apache Sprayer. Sprayers are distributed throughout the United States, Canada, Australia and C.I.S. Learn more about Apache Sprayers at www.ApacheSprayers.com.